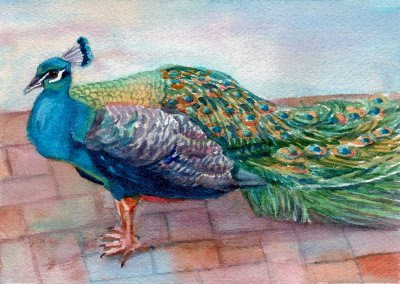 This gorgeous peacock was strutting around at the Bermuda Zoo sweeping the outdoor tile floor with his tail feathers. He was quite nonchalant about having his picture taken, and I've been staring at that picture for some time now. Finally, I just couldn't resist the urge to paint his beautiful colors!